In this fact sheet, students will learn about the people who became actors, what an average day was like and more. The life of an actor changed dramatically during Shakespeare’s lifetime. At first actors toured in companies, travelling the country to perform in towns and cities and in private homes. By the time Shakespeare died, London had several permanent theatres where the actors performed, drawing in huge audiences. Yet, despite the popularity of play-going, the acting profession had a bad reputation. Actors were seen as unruly and a threat to a peaceful society. 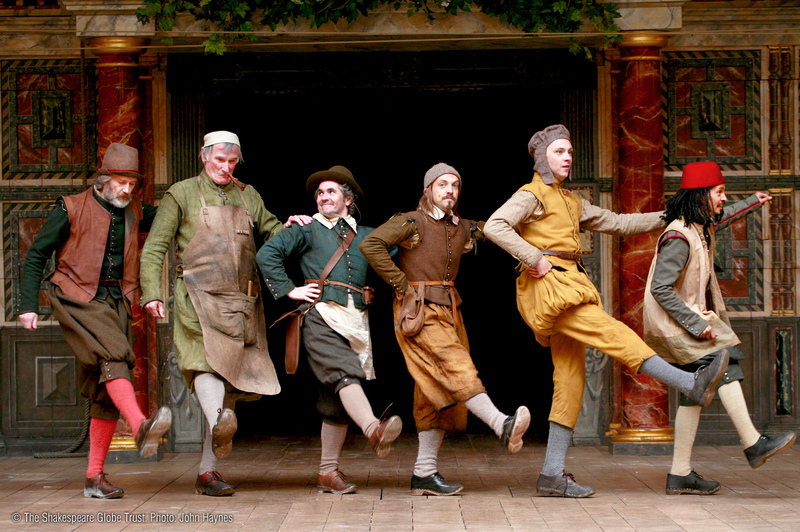 In Shakespeare’s time acting was a profession only open to boys and men. Women were acting elsewhere in Europe but they were not allowed to perform in public theatres in England until 1660. In an Elizabethan production boys would play the female parts, like Ophelia in Hamlet or Desdemona in Othello, whilst occasionally men would play the older women. There were many more actors working across the country at the time, but these are some of the best known Elizabethan actors: Richard Burbage, Edward Alleyn, Robert Armin, William Kemp and Nathan Field. What was an actor’s training? Many actors began their careers as young boys. They could join a company as an apprentice and be taught by one of the more senior actors within the company. Actors were expected to be able to sword fight, sing and dance, as well as having a good memory for learning lines. How big was a company? Company sizes varied, depending on where the company was working and how wealthy the company was. A wealthy company, when working in a theatre, might have 8– 12 senior members called sharers, 3–4 boys, a number of hired players (hired men) and then stage hands, tiremen (who would help the actors dress back stage) and some musicians. Actors would join a company under the patronage of a monarch (like the Queen’s Men) or a nobleman, such as the Lord Admiral’s Men or the Lord Chamberlain’s Men. Where did a company work? Most companies were based in London, using one of the permanent theatres. Sometimes the theatres were closed, for example when there was a plague in the city, and so companies would then go on tour. Mostly they toured England, but companies did also go abroad, particularly to the Netherlands and Germany. What did an actor earn? Many theatre companies operated a shareholder system. Sharers in a company earned more than the hired men. Shakespeare was a sharer of the Chamberlain’s Men, later the King’s Men, and so shared the costs and also the profits the company made. Actors’ earnings also depended on where the company was playing. The company made more money in London than in the country, so could pay actors higher wages. In 1597 the actor William Kendall was paid 10 shillings a week in London but only 5 shillings in the country. Actors normally performed in the afternoon because they relied only on natural light to be seen. Plays were performed in repertory, so the same play was never performed two days in a row. Actors might spend the morning rehearsing and then perform in the afternoon, but they did not have much time for rehearsals. Often they were juggling several plays and several parts at one time. How did actors learn their parts? There were not multiple copies of the play so each actor would have their own part written out to learn. An actor’s part only contained their lines and their ‘cues’ – the last words spoken by another actor before their own. There were a great variety of characters to be played and some actors were renowned for playing a certain type of part. This led to some parts being specifically written to suit the actor playing them. For example, Shakespeare’s clown, Dogberry, in Much Ado About Nothing, was written for William Kemp because he was very good at physical comedy. Similarly, the fool in King Lear was written for the actor Robert Armin, who focused on witty language rather than slapstick. And did you know that as well as writing plays, Shakespeare himself also acted in them? Legend has it that he played the Ghost in his own play Hamlet.